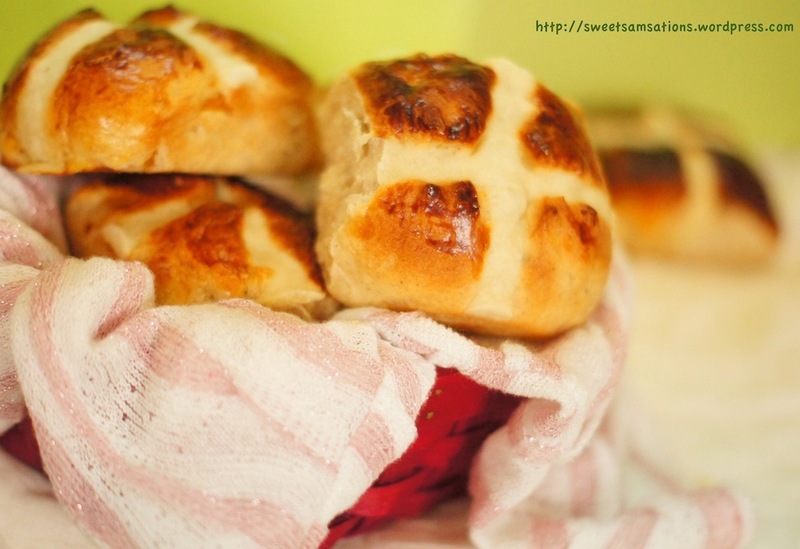 Although in the blogging world, it probably is a given that Hot Cross Buns are traditionally served on Good Friday or Easter Sunday, I only learned of it this year. The rolls got their names from the crosses piped on top, signifying the resurrection of Christ. Don’t be surprised that I am not the only one unaware of this! haha.. Except for a select number of bakeries advertising Hot Cross Buns on their display, almost no one else in Vancouver knew they were traditional rolls for Easter, even the ones who were born here! Some of my Catholic friends were even in disbelief until I Wikipedia-ed it for them. Here is the interior view of both my Hot Cross Buns. As you can see, the one on the left yielded a dense, more scone-like texture, whereas the one on the right yielded a much softer and tender texture. So, without further ado, here is the recipe! Soft and fluffy, just like little Easter bunnies! Ensure that all your ingredients are measured and prepared before you start. Read through the directions prior to beginning to gauge I used my KA for this, but you could definitely do it by hand too! In a bowl, combine warm coconut milk, yeast and 1 teaspoon sugar and stir to dissolve. Let stand until foamy, 5-10 minutes. In a separate large stand mixer bowl, beat 1 egg and 1 egg white. Using a hook pedal, add flour in gradually, about 1/2 cup at a time until blended, stirring on LOW speed. When you are within your last 1/2 cup of flour, add in dried mangos, desiccated coconut, (optional) cherries and (optional) orange zest. 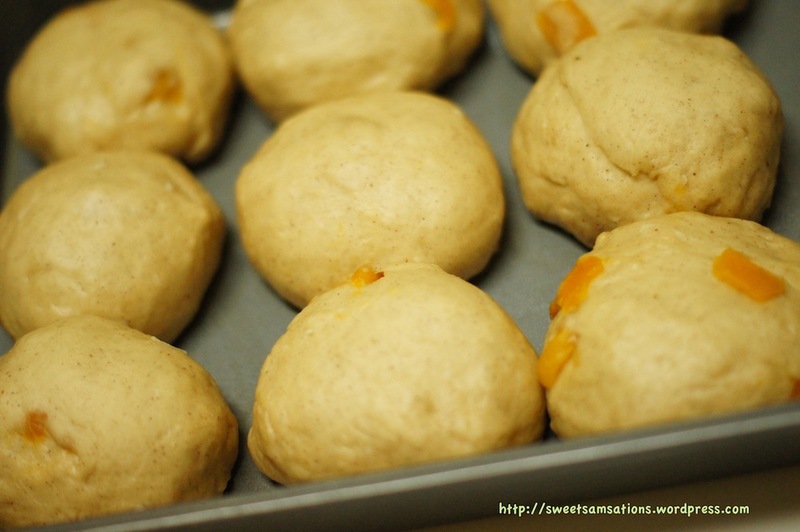 If you add in too much flour, your dough will not be sticky and your buns will not yield a soft texture. Knead your dough for about 3 minutes, then place it in a bowl lightly coated with oil and cover with a plastic wrap. Let rise in a warm place for 1 -1.5 hours. Mine only took 1 hour. When your dough has doubled in size, punch the dough down and transfer to a lightly floured surface. Knead for about 3 minutes, then divide into 9 equal pieces. Set your buns in 3 rows of 3. Leave little gap between them to achieve the “pull-apart” effect. Cover and let rise until they touch one another. While waiting for your buns to rise, make the glaze and crosses for piping. After your bread has risen, use a scissor or knife to make a “cross” incision across your buns. Brush your glaze on the buns and then pipe the crosses on. I guess I left mine in for a little longer than I should and hence the top browned a little more than I would have liked. Nevertheless, the buns were soft and very flavourful! I could definitely taste the spice as well as its tropical flavours! 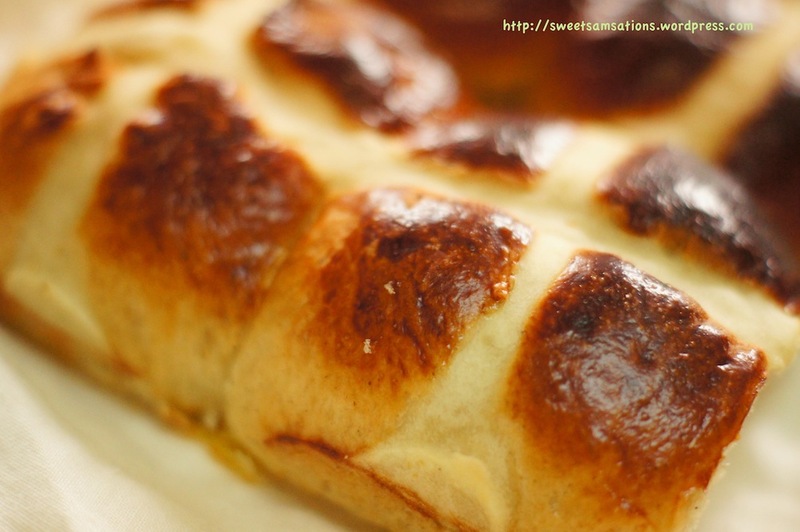 A friend said she never liked hot cross buns but really loved this when she tried it. I guess we’re all not very big fans of currants which was quite essential for traditional hot cross buns! I am aware the post is a little late since Easter has been long gone! But if you ever feel like some delicious hot cross buns with dried mangos, you know where to go! I’ll definitely be using this recipe again. Fresh bread from the oven never tastes the same as those packaged in supermarkets. True story!! Hope you guys have a wonderful week ahead! I feel like I missed the boat because I did not make hot cross buns this Easter. Yours look wonderful. What a great idea to use coconut milk and make them tropical!! Who says you have to stay with tradition? This is how “new” recipes and family traditions start. By the way, I love mango, love it, love it!!!! hehe.. Thanks Matina!! I know! Me too! I love mangos so much! Both fresh and dried are delicious to me! Awww! Thank you! Yep. Perhaps one day I’ll learn to love currants, like how I learned to love some other food. But, until them they will be substituted accordingly! lol Thanks! I agree, the use of coconut milk is definitely tropical. Those hot cross buns are gorgeous. Thanks Norma!! hehe.. wanted to try something different. The coconut taste wasn’t too strong as it was overpowered by the spices, but I tried to compensate that by adding some desiccated coconut in! love the addition of the tropical flavors! 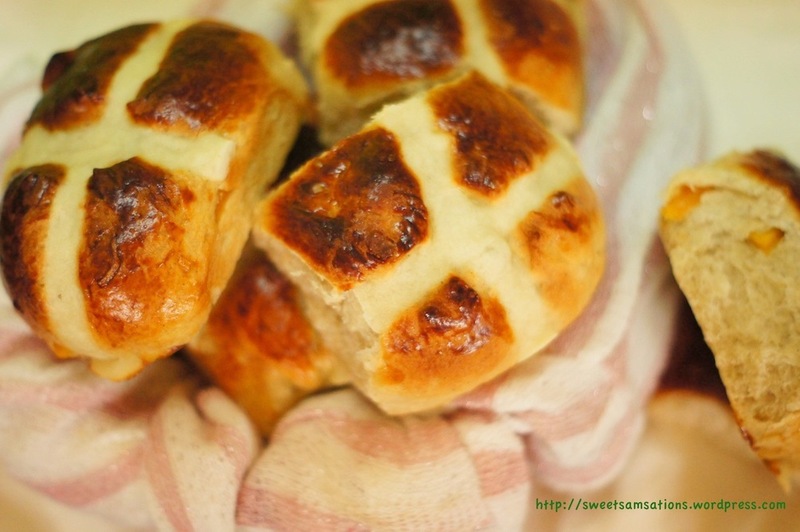 i’ve seen hot cross buns all over the blogosphere the past week, but i still have never tried them in my life. need to change that soon! Oh for sure!! They’re actually easier than I thought!!! And they don’t require crazy ingredients as well.. hoho 😀 Thanks Amy! Thank you for the bun buns BB! They were very tastey, especially with the fruits! Made for a tastey breakfast! You are welcome Beebs! Glad you enjoyed it for breakfast-ie! These rolls look gorgeous! I love the tropical flavors. It must taste divine! These are really tasty looking. (The bunny is cute, too.) Thank you for sharing the recipe and your beautiful photos – I’ll try the recipe but already know that mine won’t look quite so nice. Can’t wait! Awesome!! I look forward to your buns!! Don’t worry, they’re pretty easy to make! 😀 Yeah, I’m also digging the random Easter bunny picture. lol! They look so good. I love the addition of the tropical flavors. Not a currant fan! yupe! Agreed! Currants to the devil….. for now…! lol. Maybe one day my taste buds will develop a liking to them! But for 23 years they haven’t, so I guess we’ll have to see about that! I feel so ignorant. Had no idea these were traditional Easter or rather Good Fridays treats. Must be that the Italians didn’t do it! They do look warm and welcoming and scrumptious! me too!!! I think perhaps Canadians are not too big on Easter! I’m not sure what it is! lol. 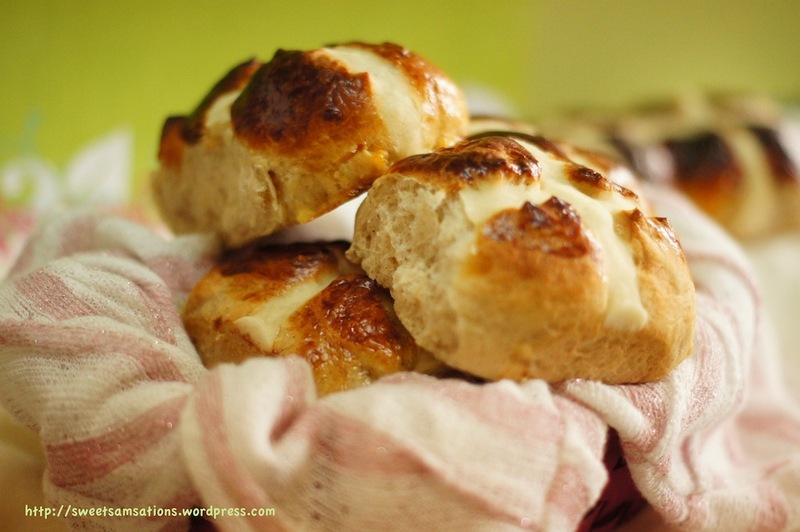 But I completely had no idea as well until my fellow American bloggers started posting up HCB recipes! hehe.. Thanks Claudia!! oooh! Yes yes!! I’m so jealous that you went to Hawaii!! Totally would love to visit as well! 😀 Sounds like you had a lot of fun though!! Yay! I’ve heard about them having RAMEN in McDonalds! That’s something I have to see!! What delicious looking buns! And, I can’t wait to try out some of your macaroon recipes you posted earlier! awww! Thank you Kate! I knowww.. That bunny is super cute especially with its googley eyes.. tee hee.. Thanks! My turn to submit a recipe to your event! hehe.. Thanks Tandy!! Yours look great too!! love the idea of making it tropical! 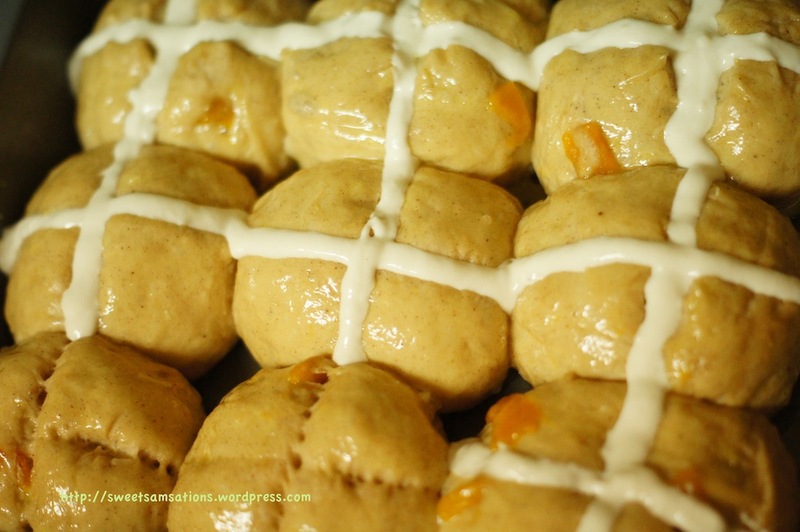 mango hot cross buns must be damn awesome!! Very creative twist on these buns. The fruit you added definitely has a lot more zip than raisins, yum! Classic recipes, while adored, can be improved upon-as shown in this post. Well done! I love your twist on these, Sam! We tried to make these last year and they were a big flop – glad these ones turned out for you. These are beyond stunning Sam! So golden and the mangoes and coconut milk sound divine! Thanks Geni! I’m a total mango person and grew up with lots of coconut milk in my desserts! So naturally I thought this would be a great idea. hehe.. Thanks! What gorgeous and beautiful looking hot cross buns. I grew up on these and so know they are related to Easter and to the death and resurrection of Jesus. Love how you made these with mangoes – I would love to try your version. 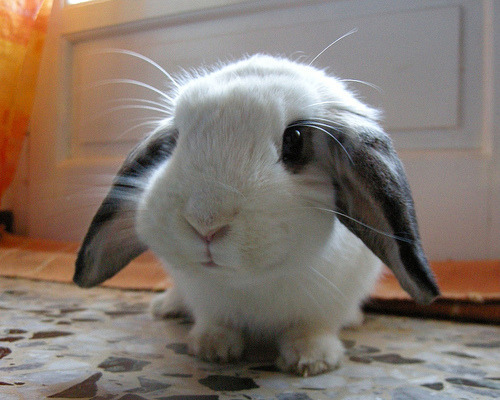 And what a cute little bunny! I don’t really see why one can’t eat these year-round! I love your tropical twist…those flavors are my favorite anyway. DROOL! Cherries and mangos in the hot cross buns? Hmmmm these are the best kind ever! I can eat them all year around and it’s worth making them all the time! Mangoes in Hot Cross buns would be so good! I never had tried it though but just by the sounds of it make me already imagine the taste. Thanks Jasline! 🙂 Let me know if you do! Mangos and coconut I’m sure go perfectly with the (supposably – never had any) fluffy texture and hey I wouldn’t mind making them all year long. Yeah! I only found out about that tradition 2 months ago! Never knew about it before too! 🙂 Thanks Tobias! Thanks so much CCU!! You’re the best!! Thanks for the recipe and hope you are having a great week Sammie! Thank you for taking part this month. I love that you have done such a unique variation. Thanks! I always love these challenges!! Lol, I’m in Cincinnati, Ohio and hot cross buns are a tradition. I’m a huge fan of the original but LOVE the idea of doing it with coconut milk and mango (my favorite fruit).